Cobbles. The bane of gamers worldwide! Nice solution to a problem and cheap is always good. I feel your pain on the £ side… Two months with out pay hurt and even though the money came in eventually I know what you are feeling. Even though I have enough models to keep me busy for years, in like the Little Mermaid. I want more! And I may have spent a little bit of cash on gaming stuff…but it was an absolute bargain, so feel justified. The next post will reveal all…. I did look at your cobblestone board, Dave, but couldn’t justify the cost. This way I can uee what I already have and put my own stamp on it. You already have yourself in a better position than I suspect you realise good friend Jez. You nearly said it yourself in your new post (most excellent by the way). 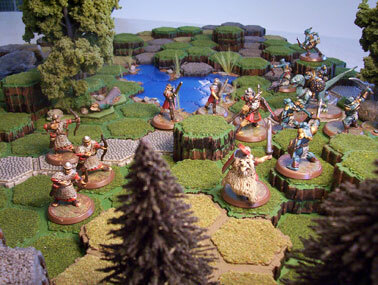 The wonderful thing about HeroScape tiles is that they can be easily and cheaply converted to your needs. especially if you plan to use them for the Blackwell project. First…. two cans of really cheap spray paint (preferably matt), Our local Lidl has these for 2 euro a can. Remember that the image of London being all cobble stoned is somewhat of a misnomer. Only the `better sort` of streets had cobbles what so ever, and places like Whitechapel… hardly at all. No the streets were mostly packed dirt with the occasional rubble or brick inlay pressed in on some of the more boggy, muddy sections liable to stop even the most robust cart or carriage. Take your HeroScape tile and lay a very.. very paper thin layer of DAZ modelling clay on the top, then with a cocktail stick, imprint some bumps and indentations. Let it dry (a few hours for something this thin), then spray the tile in light brown (or grey if you prefer the stone look). Press in a few tiny stones (from the beach or nick a handful of sand from a builders pile), and drop a few bits onto the still wet spray paint… and top off any excess. Dry brush a bit at the end for extra appeal…. And hey presto, you have a perfect facsimile tile for your games, the prime equal to any pro purchased battle mat. 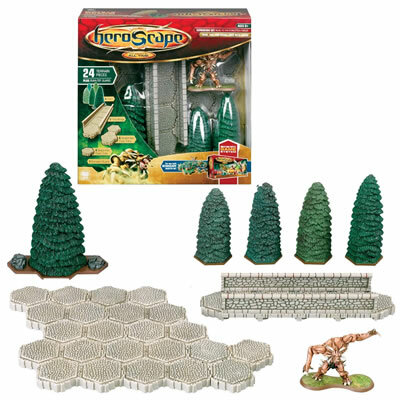 You would be able to do your entire HeroScape tile collection in half a morning this way. And the beauty is… need them later for another game and want them repainted differently… just buy a different cheap spray can and off you go again back to the drawing board. Cheers for the advice and info, Steve. I had been considering adding a bit of sand to the tile tops, to give it a bit of texture, but will be doing a few test pieces with just the paint first, to see how that works. Should be interesting to see the results.